Lt. Colonel Aged 37 Years. 4th Battalion Bedfordshire Regiment, 190th Brigade, 63rd Royal Naval Division. Lived: Field House, Off Strines Rd, Marple. Son of: Arthur & Caroline Mary, Brands House, Hughenden, High Wycombe, Bucks. Buried: Bouzincourt Ridge Cemetery, Plot 3, Row E, Grave 12. Remembered: All Saints War Memorial, Marple; St. Ethelreda's Church, Hatfield, Herts; Collings-Wells Memorial Hall, Caddington, Bedfordshire; Christchurch College Plaque, Oxford. Marple's only Victoria Cross recipient was born in Manchester on 19th July 1880. Initially his connection with the village was obscure, but on investigation there is no doubt as to the validity of his inclusion on the War Memorial. In 1906 John came to live with his Cousin, Will Buck, at his house in Marple to enable him to run his father's business in Manchester. This he continued to do until the outbreak of war in 1914. During this entire period John lived at Field House with the exception of periods where he would have to travel back to Bedfordshire to maintain his connection with the Bedfordshire Regiment. The following pages seem little space to do credit to a man who, regardless of information sources, comes through very strongly as not only a fine soldier and leader of men but a man who made a major impression on all who knew him of being a great man. John S Collings-Wells was commissioned into the Bedfordshire Regiment on 14th March 1904 following a period with the Hertfordshire Militia. He became Lieutenant in September 1904 and Captain in January 1907. On the outbreak of war he travelled to France with his Regiment on 22nd of August 1914. He was promoted to acting Lieutenant-Colonel in October 1916 a rank he held until his death. D.S.O. - Capt. (Acting Lieut.-Col.) J.S.Collings-Wells. "He commanded his battalion during the operations on the 23rd and 24th April 1917, with marked ability. The battalion captured the northern outskirts of Gavrelle on the 23rd April, and held their ground, in spite of frequent counter-attacks. When the situation required clearing up, he proceeded through the town under heavy shell and machine-gun fire to re-organise the battalion, and immediately informed the disposition of his companies. On the 29th April he was placed in command of a composite battalion with orders to attack and capture the Oppy line of trenches between the ground then held by the 188th Brigade and the 2nd Division. It was chiefly owing to his leading, coolheadedness and disregard for personal safety that the battalion reached their place of assembly, and formed up under shellfire in darkness on practically strange ground, and subsequently achieved its objects. His courage on this occasion inspired all ranks, and was greatly instrumental in carrying the operation through successfully." Collings-Wells was also Mentioned in Despatches in November 1917. The German spring offensive began to take a heavy toll on the Royal Naval Division as early as the 12th March, 9 days before the actual infantry assault was launched. The Germans put down test bombardments using mustard gas and this cost the 4th Battalion Bedfords 5 officers and 264 other ranks. The 63rd Royal Naval Division lost 2000 men in total before March 21st. When the expected German attack finally arrived, John S Collings-Wells and his battalion of men were in reserve positions but were to see action later in the day. As we know the Germans attacked with such force that the allies began a fighting retreat. This saw the Royal Naval Division move west from Marcoing (S.W. of Cambrai) to the old 1916 battlefields of the Somme (20 miles away) in just 4 days. On the 25th March John received orders to take his battalion up to High Wood to reinforce the 189th Brigade who were hard pressed. It was here that Collings-Wells once again proved his natural ability to lead men under the most strenuous conditions. His men were soon heavily engaged in action and they stayed until every round of ammunition had been used. During the fight Collings-Wells realised that his men would soon be surrounded so he called for volunteers to hold up the Germans whilst the remainder escaped. Once the withdrawal was complete John lead the rearguard to safety himself. That evening the 4th Bedfords withdrew to the Thiepval Ridge and on the 26th they crossed the River Ancre destroying all the bridges once safely over. At 7.00 p.m. that day the battalion moved into position between Aveluy and Bouzincourt (1 mile north of Albert) and were now expected to hold the Germans again as they advanced north out of Albert. It was not long before the Bedfords were to be in action again and at 7.00 a.m. on the 27th March they were ordered to carry out a counter attack south towards Albert. Again John showed himself to be a born leader of men as he rallied his exhausted troops for the final time. He led the attack himself (as usual) and despite being wounded in both arms continued until he was unfortunately killed just as the final objective was achieved. He was having his wounds dressed when a shell landed next to him, killing the stretcher bearer as well. "For most conspicuous bravery, skilful leading and handling of his battalion in very critical situations during a withdrawal. When the rear guard was almost surrounded and in great danger of being captured, Lieutenant-Colonel Collings-Wells, realising the situation, called for volunteers to remain behind and hold up the enemy whilst the remainder of the rearguard withdrew and, with his small body of volunteers held them up for over one and a half hours until they had expended every round of ammunition. During this time he moved freely amongst his men, guiding them and encouraging them and, by his great courage, undoubtedly saved the situation. On a subsequent occasion, when his battalion was ordered to carry out a counter -attack, he showed the greatest bravery. Knowing that his men were extremely tired after six days fighting, he placed himself in front and led the attack and, even when twice wounded, refused to leave them, but continued to lead and encourage his men until he was killed at the moment of gaining their objective. The successful results of the operation were, without doubt, due to the undaunted courage exhibited by this officer. "He was one of the best type of citizen soldier. In pre-war days he devoted much time to the Hertfordshire Militia and subsequently to the Special Reserve. He spent the winter of 1914-15 in France, where he was wounded and invalided home. He returned to France in July 1916, in command of a company, with the rank of Major. Shortly afterwards he became second in command and a few days before the battle of Beaucourt-Beaumont Hamel assumed the position of Lieutenant-Colonel of his battalion - a post which he held till his death in action on March 27th. For his able leadership on a recent occasion he was awarded the D.S.O. Possessing a wonderful grasp of detail and great organising ability, Lieut.-Col. Collings-Wells raised his battalion to a pitch of high efficiency. Endowed with untiring energy and activity, he stimulated a similar keenness in his officers. He was wedded to his battalion and spared no efforts to promote the welfare and comfort of his men. Perhaps his most striking characteristic was an extraordinary coolness and intrepidity under shellfire, which on many critical occasions inspired his men with confidence and cheerfulness in the face of danger." And the following letter to John's mother, written by his Regimental Sergeant Major, confirms, if confirmation were needed, his men's feelings for him. Many friends of my late commanding officer will bring to you in this your hour of trial and sorrow many reminders of your sons great qualities, but with all the respect in my nature to the mother of one of England's greatest leaders of men, I beg to inform you there are none outside his home circle of friends who will always remember him better than we, his children. He was our father, both at play and work, at fighting he was above all our leader. Our wants and pleasures were his first thought day in and day out, we became first in his mind before all things. He taught us all we knew with an unexampled sense of brave leadership, which at all times carried us to victory, never once did he give an order to any of us which he was not prepared to carry out himself. I personally have seen him in what we know as "tight corners", I have seen him when the situation was more than critical, it has looked almost hopeless at times of late, but with that well known calm of his, which carried with it coolness and confidence to all around him he has brought us through. There are places which will go down to history, the names of which I must not mention, he with a few picked men of my battalion has held them to the very last moment, while the remainder of the battalion has got away to safety, always the first to lead and the last to leave the place which was vital to our line remaining intact and never once did they get through our line. The C.O. asked for and obtained from his boy's a little more than the best, whilst his maxim to us was "Smile on, fight on and stick it" and no matter what the duty or how hard the conditions, never did they finish that duty without a song on their lips, only too happy to please their beloved leader. They loved him because he was always just and fair in his condemnation of fault, they loved him for his kindly thought in all things appertaining to their welfare and best of all they loved him for leading and being with them in action. When things grew hot we have known him use the rifle like his men and even bomb the enemy like any of the boys. His name was on the lips of those who had only been with him a matter of days, they all knew him for what he was, a fighter first and last and a great leader all the time. My Colonel inspired coolness and self determination with the spirit to win, to all of us, we shall never meet his like again. Dear Madam, your trial and loss is great, but England's loss is greater, our C.O. led my dear old battalion, we know he could have directed larger forces, therefor I beg to state that our England's loss is even greater than yours, but today our thoughts are with the mother of our leader, your sorrow is our sorrow, your loss is our loss, but our pride and memory of him will be ours always. Yours Faithfully J.C.Pearce A/R.S.M. B.E.F. 9.4.18. "It is a matter of sincere regret to me that the death of Captain (Acting Lieutenant-Colonel) John Stanhope Collings-Wells DSO, 4th Battalion Bedfordshire Regiment, deprived me of the pride of personally conferring upon him the Victoria Cross, the greatest of all awards for valour and devotion to duty. 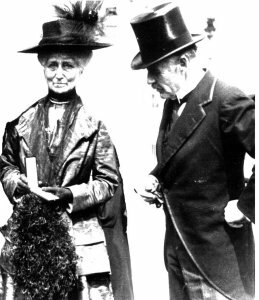 The picture, right, of John's parents after receiving his VC from King George V was not received by the authors of the book Remembered until after it was published, so sadly it could not be included. As an interesting post script to the Collings-Wells saga the following letter was addressed to The Times (date unknown) by Mr G. Martin. When serving as a junior commissioned officer in the 4th Battalion of the Bedfordshire Regiment (then attached to the 63rd Division) in France during 1916 I was invalided from the trenches and sent to the nearest base, where I underwent medical treatment until fit again for active service. Before leaving my battalion in 1916, and at the special request of one of our then Captains, I gave him my map case, bearing my own name stamped thereon, having no further need for it. I thought no more of the matter until about a couple of years ago, when I received a communication from the Imperial War Graves Commission, returning the same map case, battered and mud-stained almost beyond all recognition. They informed me that it had been found with the remains of an officer in the Bedfordshire Regiment, identified as such by the tunic buttons, who, it was thought, had fallen early in 1918. I immediately identified the map case as the one I had formerly given to Captain Collings-Wells, of my own battalion, when I left them in 1916, and informed the Imperial War Graves Commission to that effect. This officers relatives were inclined to accept this evidence, after consultation with the authorities at the Imperial War Graves Commission, and a memorial cross is now being erected at Bouzincourt Ridge Cemetery, near Albert, to Lieutenant-Colonel J.S. Collings-Wells V.C D.S.O., etc.